This isn’t a review, it’s more a response to a performance called Physical Fractals I saw a couple of days ago. I first heard of Chaos Theory some time after James Gleick’s book – Chaos: Making a New Science – was published in 1987. It popularised the idea that a butterfly could flap its wings and that these vibrations in the air would eventually determine weather patterns elsewhere in the world. Natalie Abbott’s choreography – Physical Fractals – has nothing to do with Chaos Theory. 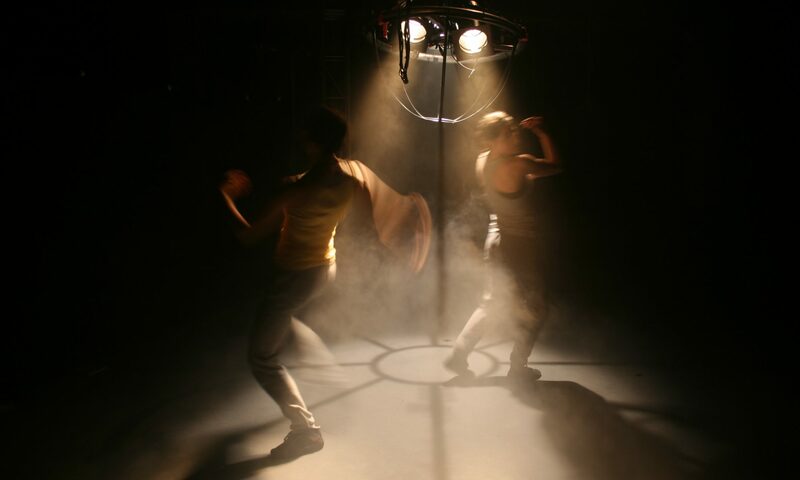 The two performers – Sarah Aiken and Abbott herself – perform and repeat a relentless series of physical actions. The movements are focused around the central axis of the body, sometimes revolving around it, sometimes extending away from it. What is alive about this danced material is its repetition. The performers appear to mark a kind of radial design on the floor; and as my eyes and ears become tuned to the sameness of the patterns, I start to notice difference. It’s delicate and delightful, as if I am involved in a game with Abbott and Aiken akin to completing a jigsaw puzzle: I become more and more aware of the nuances of the colours, actions, sounds, and difference. Always the difference. I’m reminded at times of Anne Teresa de Keersmaeker’s Rosas danst Rosas (1983). Where de Keersmaeker showed her mathematical hand in peeling away variation upon variation, Abbott simply sticks to theme. The maths is present, but the details seem less explicit than the effect of the repetition – and time – on these two women. Indeed, Abbott’s sensitivity to time in the work is remarkable. She stretches and cajoles it into unholy lengths, and pries it back to the briefest of instances. I’m given leeway as an audience member to drift through my own time – to notice things, miss other things, to remember, and to dream. The sound – generated by perhaps eight microphones on the floor around the performance space, and then manipulated in real time by Daniel Arnott – is beautiful and brutal. We hear our own echoes – a cough, a sneeze – and the breathing and stepping of the performers. But it is often out of sync – sometimes pre-empting, sometimes fading out beyond what we have just seen. The sound tugs at our vision, and it is like I am watching (with my auditory system) a blurring of repetition. Across from my location – the audience is seated along two arcs of the same circle, split by two lighting banks – is a young boy. He is fidgeting, clearly frustrated by the tedium repetition, and his legs are constantly flicking in and out. It is as if he is fanning the two performers, and I imagine him conducting what is happening before us, as his legs/wings eventually (and inevitably) break into and determine the fragile chaos of Abbott and Aiken’s performance. The power of Physical Fractals is that the accumulation of the simplest of dances starts to tear into these two women. As our senses are teased, and nudged, they become victims of their own making. They are paradoxical beings: strong and controlled, but wrestled from within by cycles of patterns and the pathos and vulnerability of physical endings. The film was shot last summer in South Uist – remarkable place – and I got to do some dancing with Rosalind Masson and Dai Jian. I like your rants on Spangbergianism. They keep me on my toes, and this is a good thing for a dancer. PS. In your current ‘series’ you are totes on fire. Long may it continue. What interests me about Murakami’s statement is that it works paradoxically against the potential for art and arts-based research to clarify, reduce and generate certainty. I don’t mean that certainty is something to be avoided, but rather that resisting conclusions is valuable in how we think and talk about our work as artists (regardless of the context within which we are working). But how is it valuable? Consumer capitalism demands certainty – how much money we make, what we are prepared to buy, our likes and dislikes, our economic value to society – and in generating problems or ideas that are inconclusive, I imagine the smallest kind of reconfiguring of how I am able to participate in this economy. This occurs at various levels, but the one I am most involved in is higher education in the UK. What are the ramifications of being what is called an ‘active researcher’ in higher education and then to to only produce inconclusive ideas and projects?